NEW YORK—At a time when time seems to be moving faster than ever, when the world feels confusing, chaotic, when vulgarity is even celebrated, and so-called art can look no different from curbside garbage, Rodney Smith continues to make, dare we say, beautiful pictures. His photographs tease one to question, to wonder, to feel delight in a moment captured. Even when we are overloaded with images, his photographs are unforgettable. The beauty conveyed stems from a man who cares deeply about sharing his vision with optimism, despite all the harshness of the world. “I kind of represent a world that is possible if people act at their best. It’s a world that’s slightly beyond reach, beyond everyday experience, but it’s definitely not impossible,” he said reflecting on his work at his studio by his home in The Palisades. Smith laments what he called the unfortunate repercussions of modernism. “It has created a kind of vulgarity, a kind of anything you feel and think is just ‘spout it out.’ It can be in your face, there is no refinement at all. The sense of decorum has left, and I think that’s a problem for the culture,” he said. “Why isn’t there a counterpoint to the world, why isn’t there something that is really beautiful, serene, and graceful to pull people out of that?” he asked. Similar to the effect of a 1940s movie—showing idealized relationships between men and women, with a sense of civility and refinement—he wants his photographs to pull people out of ugliness. He feels it is his calling. It’s the central issue he’s been concerned about perhaps from the very beginning. It was also the same first topic he brought up when I interviewed him for a small photography magazine 20 years ago. “I realize everything has changed, but remember a change is not necessarily an improvement,” he wrote in his blog, “The End Starts Here,” where he shares his musings with much revelry and insight. Although the classical and whimsical aesthetic in his photographs—which appear in countless magazines, books, and galleries around the world—is easily recognizable, his name is not widely known. He recently completed his fifth book, a retrospective coffee table book that includes over 175 photographs from the past quarter century of his 45-year career. It’s his only book so far that includes some color photographs, which he only started taking 10 years ago. Cover photograph of “Rodney Smith” his retrospective book. The book, simply titled “Rodney Smith,” will be distributed for sale in bookstores and online next year. He priced it at about half of what he normally would because he wants to make his photographs accessible to a larger audience. Everything about Rodney Smith seems paradoxical. His photographs look planned, but they are actually spontaneous; he dresses and looks like a CEO, but he’s actually very eccentric; he’s a private person, yet he shares quite personal details on his blog; he’s not interested in fashion, and yet he shoots fashion photographs; while maintaining a serious and critical demeanor, he’s also very optimistic and witty; he feels anxious and small, yet his images are serene and powerful. He knew he wanted to be a photographer during his junior year in college, when he visited the permanent photography collection at the Modern Museum of Art (MoMA). He felt he belonged, having an epiphany that photography was a way he could express himself. One of Rodney Smith’s early photographs. Smith studied theology at Yale, all the while knowing he would become first and foremost a photographer. It provided him with a foundation for asking essential questions—about existence, why we are here, and what is the purpose of life—questions that would help him process his confusion. His creative process is intricately connected to how he examines his own life, how he gets to know himself, how he draws clarity from his emotions and translates them into pictures. It’s an arduous process well worth the journey. Through that journey his early work depicted people like farmers and sharecroppers in different parts of the world, landscapes depicting a very different world from the affluent lifestyle he grew up in. Then, much to his chagrin, he took portraits of top CEOs of multinational corporations, men like his father. Eventually, also much to his chagrin, he took fashion photographs, featuring models in landscapes, men wearing suits and hats. Each transition required tremendous effort for him to adjust emotionally. He continues to shoot photographs with his Hasselblad camera, mostly in black and white, with real film only, in real locations, and strictly with available light. Today, especially in the digital age, it is very easy to shoot technically competent photographs, but Smith argues that the number of photographers who have a unique vision is very small, maybe 1 in 15,000. He mentioned Henri Cartier-Bresson, Irving Penn, W. Eugene Smith, and Dorothea Lange as examples—the photographers he had encountered at MoMA. “A photograph is a really complicated thing in the sense that you are qualifying and quantifying this three-dimensional world, and maybe its even more than three dimensions, but anyway, this three dimensional world which is full of all kinds of senses—sound, smells, taste, and memories—to qualify it down to a two-dimensional piece of paper, and then ask people—who have no relationship to you or to your experience—to look at it and say, ‘I like this picture.’ That’s what those photographers could do,” he said. 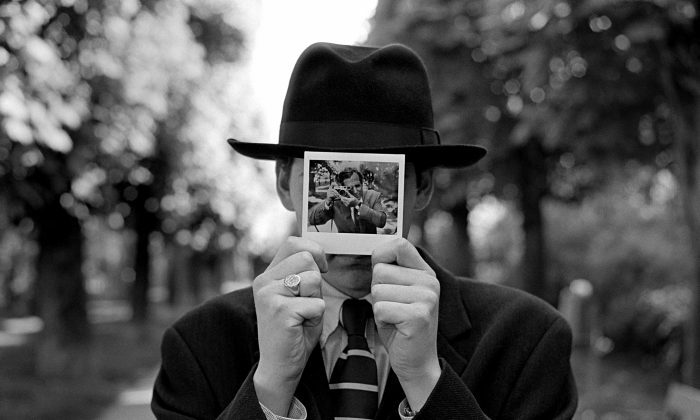 Rodney Smith’s self portrait in a photo held by his son. “It’s really hard to have a vision. … To have something to say, to have it be apparent in all the pictures, so that somebody says ‘Oh that looks like a Rodney Smith,’ whether it was shot 50 years ago or today, that is a very hard thing to do,” he said. Then he implied that it’s nearly impossible if you don’t have something to express from the heart. Smith has taught photography students at numerous universities and institutions, such as Yale, The New School, International Center of Photography, and Pratt to name a few. He has changed many of their lives, encouraging them to find their voices. “You don’t have to worry about being like anybody else if you can touch your own special voice, but you would be amazed at how people resist that. They do not want to go there because it’s a psychological journey; it’s not a mechanical journey. And people don’t want to deal with their past, their history, their emotional core, it’s too painful for them, so they stay on the surface and they make pictures that are alright, but not really powerful. And so you have to really want this, you have to be willing to go to places that you may not want to go to,” he said. Smith trusts his instincts to get to the heart of the matter. If you watch him work you will see him move around and all of a sudden he will stop when he has found the right spot to take a picture. While most of his photographs look as though they were carefully planned out, his best are a triumph of spontaneity and letting go. “It’s an intuition about what is proportion and scale and how I am relating to the subject. It’s not an intellectual concept; it is an emotional concept. Also if there are other people in the picture, it’s about how they relate to each other, so it’s all a very complicated thing,” he said. First he must find the location, then everything else follows. Having studied with Ansel Adams he knows his technique, he knows how to photograph landscapes, and how to integrate the subject into the landscape. While he’s intent on the composition, inadvertently many of his photographs tell a story. “Composition is like rhythm in music, it’s where everything is in sync. It’s where the whole picture comes together succinctly and carefully,” he said. Perhaps the reason why Smith’s photographs feel timeless is because of their cadence and classicism where the proportions, the scale, and the relationships feel just right. Most of the time Smith feels estranged from the world. Taking photographs has been his way of reconciling the mundane with the ideal. “I’m always at that eccentric part, that loner that is sort of on the outside, but always looking in—always sort of peering through the door, sort of looking in, but never quite going through it,” he said. Calling himself something like one of the last Mohicans of photography, he has been fighting for pictures all his life, staying true to his vision without any separation between what he has done commercially and his own work. At the beginning of the interview for this article, he offered coffee in delicate China, placed on a silver tray. Classical music played softly in the background as a canary in a cage chirped along. Like his photographs, his home, studio, and garden are equally peaceful, elegant, and carefully pruned. He joked about wanting to interview the photographers who came with me instead. He was curious about their work and shared some wisdom. “Nothing has ever, ever been easy for me, I mean people come here and they think ‘This guy does really well.’ But for 25 years I never made a penny. I mean I struggled just to eat, and I wouldn’t sell my work when people wanted to pay me very little for it. I have fought the battle for photography for so long, it’s not an easy life and if you want it, you have to really fight for it because no one is going to give it to you,” he said to the Epoch Times photographers. Smith represents photographically and maybe even personally a completely different era than the era we live in today. His classically styled home, studio, and garden reflected that as well. New York Philanthropist Joan K. Davidson talks about her books grant project, Furthermore, the virtues of print, community building, and heritage. Artist and founder of the Grand Central Academy Atelier, Jacob Collins talks about his creative process and re-establishing masterful art. French photojournalist Yann Arthus-Bertrand’s latest documentary film, “HUMAN” seeks to help us understand #WhatMakesUsHUMAN through interviewing over 2000 people in 60 countries.